Another example of an ancient and venerable Holy Week ceremony abolished in the 1955 reform was the final part of the Good Friday liturgy known as the “Mass of the Pre-Sanctified.” The last time it was celebrated in the Roman Rite was April 8, 1955, after which it suffered a damnatio memoriae (1) by official decree. It is understandable that Crammer eliminated the Mass of the Pre-Sanctified in the 16th century so as to eradicate all its identifying marks and to cancel every trace of its existence. But for this to happen under Pius XII is beyond comprehension. Before dealing with the chain of events that led up to its abolition, let us keep in mind a few facts about the Mass of the Pre-Sanctified that aroused intense disapproval among the progressivist reformers. As no Mass is celebrated on Good Friday, an ancient tradition developed incorporating some of the prayers, gestures and vestments of the Mass, but without the Consecration. Holy Communion was not distributed, as the sole recipient of the Sacrament was the priest. He consumed a Host that had been previously consecrated – hence “pre-sanctified” – at the Holy Thursday Mass and reserved at the Altar of Repose. Thus, he could, as it were, prolong the experience of the previous day’s Mass at one remove. The whole symbolism of the Mass of the Pre-Sanctified illustrated the essential link between the Last Supper and Calvary and the indispensable role of the priest. It was a shining example of how the lex orandi supported the doctrine of the Mass and the priesthood, reinforcing in the priest’s mind his exalted status as an alter Christus. So, when the reformers demanded that the rite should be scrapped, alleging it was a useless formality and had been “introduced without reason,” (4) they could not have been further from the truth. They failed to appreciate that the reason for the symbolism was to give access to mysteries of the Faith that would be otherwise inaccessible to the human mind. For the more symbolic gestures point to the numinous, the better we can approach transcendent realities; and the more they are curtailed, the less we surpass the domain of this world. 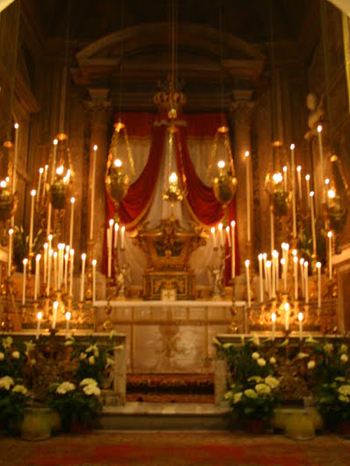 In fact, the Mass of the Pre-Sanctified is entirely composed of symbols of the sacred. 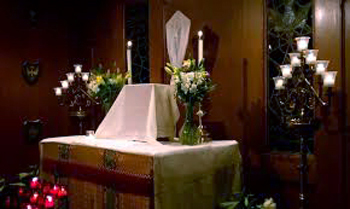 First, there was a solemn procession in which the priest, accompanied by all his ministers, went to the Altar of Repose to fetch the pre-consecrated Host. This had been placed in a specially prepared chalice. (5) On his way back to the main altar, he was preceded by two acolytes walking backwards as they incensed the Blessed Sacrament, while the choir sang the Vexilla Regis. But, after the reform all this disappeared. The priest was denied his rightful privilege of carrying the Blessed Sacrament. He was instructed to sit while the task was performed by a lesser minister. Now, we have reached the point where it is done by anyone at all, including children. Also, he was denied the unique privilege of receiving Communion from the large Host (which was itself abolished for Good Friday), and was made to receive a small one instead, on a par with the people. The incensing of the Blessed Sacrament and the singing of the choir were abolished, and the rather deflated procession took place in silence. We can see in this reform the beginning of a slippery slope that ended in today’s less-than-reverent treatment of the Sanctissimum, the Most Holy Sacrament. As for the Vexilla Regis – the famed Hymn of the Cross par excellence – it was excised in spite of its intrinsic worth and its right to honor, which immemorial and universal usage had given it. 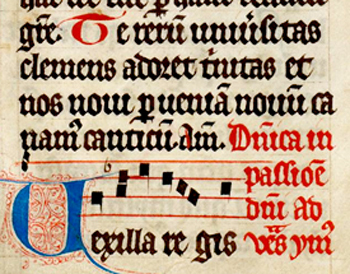 It started life as a processional hymn when it was first sung in 569 during the reception of a Relic of the True Cross by Queen St. Radegund for the consecration of her Abbey of the Holy Cross in Poitiers. It sings of the splendor and triumph of the Cross from which Christ rules over all nations – hence its relevance to the Reign of Christ the King. Composed by St. Venantius Fortunatus when the foundations of Europe were being laid, it has particular significance for the Church’s subsequent and beneficial influence on the history and formation of Western society. It illustrates the essential bond between the Eucharist and the Cross, which is also the theme of the Mass of the Pre-Sanctified. Already by 1955 the new theology of the “Paschal Mystery” was being promoted to replace Christ’s Passion and Death by His Resurrection as the cause of our Redemption. (7) The road to the Novus Ordo was, thus, being paved when the expiatory Sacrifice of the Cross was being minimized. Even the last three days of Holy Week are now called the Easter Triduum . It was an official sanction used in Roman times to obliterate the identity of a public figure, especially an Emperor, who had fallen out of favor. It consisted of deliberately vandalizing, mutilating or defacing any statues, portraits or coins bearing his likeness so as to eradicate his memory from the collective consciousness of the Roman people. This practice was adopted by modern totalitarian regimes, particularly the Soviet Union. ‘Instruction for the Proper Celebration of the Restored Order of Holy Week,’ November 16, 1955, § 8 and § 9. Pierre Jounel, "The New Order of the Holy Week," La Maison-Dieu, n. 45, 1956, p. 29. Nicola Giampietro O.F.M. Cap, “Il Card. Ferdinando Antonelli e gli sviluppi della rifornia liturgica dal 1948 al 1970” (Card. Fernando Antonelli and the Development of the Liturgical Reform from 1948 to 1970), Pontificio Atteneo San Anselmo, Rome 1998, p. 59. This took place during the Mass of Holy Thursday after the priest had consecrated two large Hosts, only one of which he consumed, the other being destined for his Communion on Good Friday. The second Host was placed in a chalice, covered with an upturned paten and a silk veil that was tied at the node and taken in solemn procession after Mass to the Altar of Repose. Mgr. Léon Gromier, “The ‘Restored’ Holy Week,” A Conference given in Paris in July 1960, published in Fr. Ferdinand Portal’s magazine, Opus Dei, n. 2, April 1962, Paris, pp. 76-90. This theological inversion runs counter to the teaching of the Council of Trent, which has defined infallibly that the “meritorious cause” of our salvation is Jesus Christ, wrought through “His Most Holy Passion on the wood of the Cross.” The Ottaviani Intervention made clear in its critique of the Novus Ordo: “Even the phrase in the Instruction describing the Mass as a "memorial of the Passion and Resurrection" is inexact [emphasis in original]. The Mass is the renewal of the unique Sacrifice, redemptive in itself; whereas, the Resurrection is the fruit which follows from that sacrifice [emphasis in original].